Bernini is one of the most important artists of the XVll century. He was an architect, a sculptor, a painter, a scenery designer and he also wrote many works of theatre. He was born in 1598 in Naples. His father was also a sculptor and a painter and he fastly noticed his son’s talent. he found out very fast that his son was even better than himself. The great career of Bernini started in Rome; his family moved there in 1605, because the father was a quite famous artist, one of the most important representatives of the Manierism. During the late Manierism, the young Gianlorenzo Bernini showed his interest for the Hellenistic naturalism, especially in his first works (“Giove fanciullo e la capra Amaltea” 1615, “Plutone e Proserpina” 1621, “Enea e Anchise” 1622, “Apollo e Dafne” 1622, “David” 1623). After his first works he started a series of works in the Basilica di San Pietro; he actually spent 40 years working on it. The first work on the Basilica was the Baldachin, started in 1624 which had a new and original shape of bronze and was located just beside the cupola. While he was working on the Baldachin the artist needed a huge amount of bronze. At the same time the Pope Urbano Vlll needed a lot of bronze to make 80 mortars to put into the Castle of S. Angelo. The bronze that was necessary for both the Pope and Bernini was taken from the Pantheon, which was full of decorations made of Golden Bronze. The Pope promised Bernini all the bronze left after the construction of the mortars. In that period Bernini hired a young and shy co-worker, with no experience, but very talented, Francesco Borromini (he came from a small village in the Canton Ticino). Bernini’s artistic activity in Rome was very intense, so that he needed an entourage to help him. He worked with his brother Luigi, Francesco Borromini, Ercole Ferrata and Cosimo Fancelli. By that time he fell in love with a very voluptuous woman, who was Costanza Buonarelli. The woman was married with a very good friend of Bernini, but he could not avoid that passion. The artist was completely absorbed by all his success, so absorbed that he lost the control of his life. When he foud out that his lover had a relationship also with his brother too, he tried to kill him. He never fotgot Costanza Buonarelli, he was obessesd with her, so one day he payed a killer to stab her (we do not know anything about the woman, after this episode). In the same period he was still working in the Basilica of S. Pietro. He created the coating of marbles in the aisles and the funeral monuments of Urbano Vll and Alessandro Vll. Soon after drew a project ofr two bell-towers, but it did not work. After one year he started his most important and beautiful work in the Basilica: the Columns. He worked on three other Churches: S. Tommaso in Castel Gandolfo, the Church dell’Assunta in Ariccia and the Church of S. Andrea al Quirinale, setting the basis for the rules of the Barocco Style. Bernini was considered a great sculptor, but he also received many critics for the bell-towers that he built near the Pantheon. He had the protection of the Pope Urbano Vlll, but when this one died, he fell into disgrace with the new Pope, S. Pietro d’Innocenzo X Pamphili. Borromini became the new Pope’s favourite sculptor. 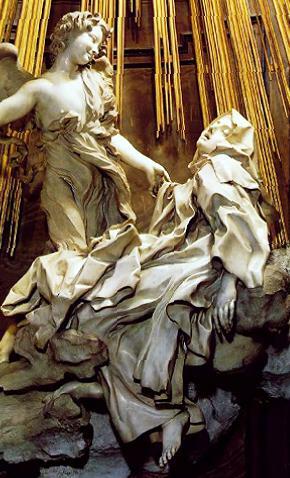 By that time Bernini created “La verità scoperta nel tempo” (1644), which his in the Galleria Borghese and “l’Estasi di Santa Teresa” (1647), which is in Santa Maria della Vittoria. “L’Estasi di Santa Teresa” was probably his most poetic and passionate work. The new Pope asked Borromini to create a huge and spectacular fountain, but he completely dislike the project made by the artist, which was too simple. Simultaneously Olimpia Maldalchini Pamphili (Pimpaccia), that was friend with Bernini, showed the Pope a project that her friend had drawn before. the Pope absolutely loved it and he asked Bernini to realize it. The fountain represents the highest expression of the Barocco style. The main idea was to represent the rivers of the wisdom that reach the four angles of the Heart: Europe, Asia, Africa and America. The rivers are: the Danubio, the Gange, the Nilo and the Rio della Plata. In this masterpiece Bernini also put the representations of some monsters: a dragon, a horse and a lion, Although Bernini received many critics, the sculpture was finished in 1651. This great success made Bernini so famous, that Louis XlV invited him to his Court and he also asked him to realize the façade of the Louvre. For that reason the artist went to Paris in 1665. Unfortunately the project of Bernini was not accepted, anyways he realized the equestrian statue of Louis XIV (Versailles). Even the Cardinal Richelieu asked Bernini to make a work about him, and the artist realized a great portrait of marble for the Cardinal, making him incredibly impressed. Bernini’s last work was a great Christ of Christine of Sweden “Il Redentore”, which actually was the most poetic work of his life. He died when he was 80. He was an extraordinary man, a genius who had a great consideration of himself, who loved the power.